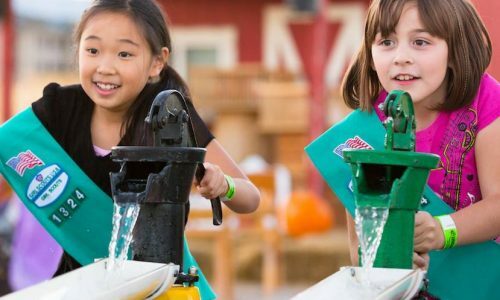 When the Girl Scouts redesigned their badges in celebration of the organization’s 100th birthday, the goal was to maintain the tradition in a way that is appropriate to the changing world around us. At Ramseyer Farms, we understand that dual goal because we are a traditional family farm trying to adapt to a changing world. We are happy to both help Scouts of all levels achieve their badges, from Daisies to Ambassadors, and to learn from the insights of Scouts. We offer scouting activities that range from fun team-building outings to individual programs that can help advanced Scouts earn badges. Ramseyer Farms has dozens of great activities that can give your Scouts the opportunity to be both competitive and cooperative. The hayrides, mazes, and spud slinger can be the backdrop for a fun, exciting, and social day, and you can light up the night at one of our campfire sites for a truly special day. Scouts have also enjoyed a hands-on activity making butter and tasting it on a cracker (nominal fee). There are many fun patches Girl Scouts can order after a day having fun on the farm! There are many ways Scouts could choose to work on badges here at Ramseyer Farms. For example: Juniors could work at taking pictures for their Digital Photographer badge and Brownies could use the great outdoors to test their 5 senses as they work on earning their Senses badge. Working on earning badges at Ramseyer Farms can be fun and educational. Ramseyer Farms is located between Columbus and Cleveland, near Canton, Ohio. To learn more about our scouting programs, please call 330-264-0264 or email us today.